If you are experiencing stubborn water stains and limescale in your shower, tub area or and the faucet handles, then chances are you have hard water which is quite likely living in our beautiful mountainous valley. A water softener will help and make a night and day differance, especially when taking a shower. Hard water is caused when pure rainwater runs through dirt, rocks and sand and in the process absorbs minerals like calcium and magnesium. This hard water can leave calcium deposits on nearly every non-skin surface and will eventually clog water pipes. Additionally, it leaves scale on taps and porcelain and can be hard on appliances like dishwashers, coffee makers, washing machines and hot water heaters causing build-up, wasted energy as well as shortened life of the appliances. Hard water can also cause rough dingy laundry, clog skin pores and may be the culprit in brittle hair or hair that feels filmy, firm, hard or has a straw-like texture and limp looking. 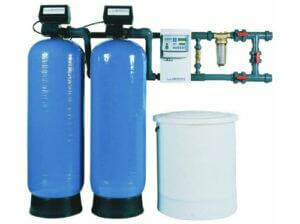 We install water softeners that range in size and budget to meet your needs. Keemer Plumbing proudly installs water softeners of any of the major brands. Call us today for a free estimate and start enjoying the benefits of soft water in your home. Here at Keemer Plumbing we service the Salt Lake City, Kearns, West Valley Utah metro areas for your Water Softener System! Call text, or contact us by email and we will get to you right away! Patrick is amazing! I am on call 24/7 and they have always ran on my stuff asap!. Thank you guys.